Sign-up to receive a text alert for the next date. The Comedy House is looking for all original funny acts to perform with our regional and national touring comedians. We want to hear your jokes and see your stage presence. This is your chance to audition for The Comedy House! For the best results, you should bring your fans, family, friends and neighbors! This show is for amateur comedians as well as local and regional professionals who want to work ORIGINAL material. G, PG and PG-18 rated material only. Excessive cursing and vulgar language is not appropriate for this show. Don’t sign-up if all you have is R rated and/or stock material. No free styling! You will be required to turn in a set list of the jokes you are going to tell. A set list is a piece of paper that goes in your pocket (or sometimes on the stool) while you’re on stage that reminds you of what subjects you are telling a joke about. Only write one or two words per subject on your set list. 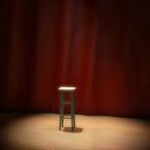 This helps with stage fright and the fear of forgetting your jokes. Producers will determine the order of appearance. Please dress appropriately (no armpits, thighs or underwear visible). No music may be used for your set due to music copyright infringement on social media sites. If you are “not in your right mind” as determined by the producers, you will not be allowed to perform. Heckling or disrupting other performers WILL NOT BE TOLERATED. Arrive for sign-up between TBD. No late arrivals will be allowed to perform. No calls to sign-up or to make an excuse why you will be late. No exceptions. No kidding! that can conduct themselves professionally at all times while in the venue. LIVE on the Comedy House social media platforms. What happens after Open Mic? The “comedy business” for aspiring comedians from Peter’s view. Becoming a successful Comedian means not only do you have to master joke writing and telling, you must also be able to deliver paying customers to the venues that you are performing in. The comedy clubs have been doing this heavy lifting for 30 years. All the old guerrilla marketing tricks (street teams, mailers, cross promotion, window posters, radio) have gotten too expensive and produce very little results. Social media Comics are getting bookings because they can put their followers in the seats with NO expense to the club. This is a win for the business of running a comedy club. You should be concerned how many people you can put in a venue before you get booked there. Work on all the social media platforms and build your followers daily! Especially as you do Open Mic. I know Comedians who make their families buy tickets to their shows! The exception is mother, father, spouse. Extended family should pay at the door and not show out while attending the show. Just understand that when you giveaway tickets to see you, that is one less seat the club could have sold. Entourages and Green Room riders cost a comedy club a lot of money that has nothing to do with you getting paid, the club making a profit and staff getting tipped out. Frankly, the club and staff see it as your ego gone wild. You – the comedian, will get your $ at the end of the engagement. If your entourage has created chaos behind the scenes, drank and eaten free; that can cost the club hundreds of dollars and wait staff their nerves. Good clubs keep track of your expenses for each engagement. We review it before deciding whether to book you again. Help the club make money instead of spending it in your Green Room. You should “ball out” with your entourage after you leave the club. If you have swag, set aside some freebies for the club staff. They are your secret voice to getting booked again. If the staff likes you, they will remind the booker/promoter about you! Be sure to “over tip” them when they wait on you. Time they spend serving you is time away from paying/tipping customers. The wait staff is a very important part of you having a successful engagement at the club. Don’t be a BMW! Bitcher – Moaner – Whiner about the show or club. Nobody wants to hear it. Tell your jokes, do your time and be nice to the customers and staff. The only time to be a BMW is when you are getting paid behind closed doors with the owner. That is the time to talk about problems and what to do about them next time. If you are doing a guest set or Open Mic you should just keep it to yourself and not say anything. Never talk bad about a fellow comedian or the club on stage or in public. Especially on social media! It will get back to the fellow comedian or owner. It always does. Always research the club or venue where you are going to perform. Read over their entire web site and check out all their social media platforms. Follow them, sign up for email etc….As a comedy club booker, I am annoyed when I get a request from you to be booked on a specific date that is clearly booked on my web site calendar. Best time to call a booker/promoter is 2pm – 4pm. Tuesday-Thursday. Never call early am or when the club has a show in progress. If you are doing Open Mic at the Comedy House, you will be asked what #8 says on this page.